September is here! I always look forward to the late summer and fall months on the farm, and though the temperatures are still going to be in the 90s this week, the promise of cooler days and nights is not far off, and soon we will transition to harvesting more of the leafy greens that we take a break from in the peak of summer. 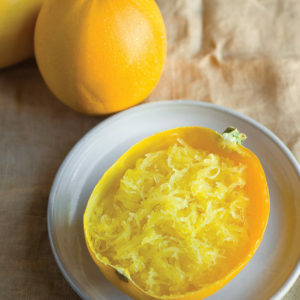 We have begun to bring in the winter squash and will send you home spaghetti squash this week. There are countless ways to prepare a spaghetti squash, and perhaps you have your favorite already. We have included a recipe below for you try that pairs it along with tomatoes, garlic and basil, all of which will be part of this week’s distribution. 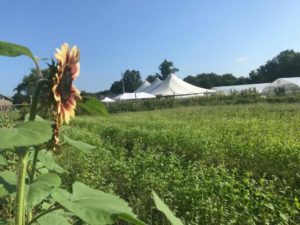 The U-Pick area will be limited to herbs for the next few weeks as our cherry tomatoes are in their final moments (our farm team will pick them and mix them with our plum tomatoes for you to enjoy), and the green beans have succumbed to the damage of the bean beetles. We hope our last planting of beans can hold off the beetles and yield a final harvest in a few weeks, and we’ve planted fall snap and snow peas for the first time with an eye towards potentially extending the U-Pick season a while longer. Thank you to everyone who celebrated with us and/or helped make our annual Dinner on the Farm event possible this weekend! We had a beautiful evening, delicious food and drinks, and most importantly, an incredible gathering of people coming together to share themselves and all this here at our Massaro Community Farm. We host this event each year on Sunday of Labor Day Weekend, so if you were not able to join us this year, please put it on your calendar and try to join us in the future!